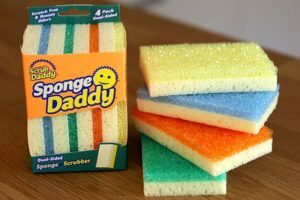 With the much-anticipated new products from the Scrub Daddy range finally landing in the UK and Ireland, we can totally understand how overwhelming they can all be coming at once! So, we’ve put together a super easy guide to help you find the right match for you. Good for: removing stains and marks from your home with just water, the FlexTexture® side can scrub away tough stains first and then be wiped away with the PowErase™ side, cleaning soles of shoes, wiping away fingerprints. Benefits: ergonomic shape for easy holding, variety of colours for colour coded cleaning, no harsh chemicals needed, FlexTexture® side changes texture in water temperature. Good for: powering through stuck-on stains, scouring burnt-on food from pans, cleaning ceramic and enamel hobs. Benefits: sturdy core distributes pressure effectively, 32% thicker, 65% stronger and absorbs 64% more water than the leading competitor, soft in warm water, firm in cold water, mix and match colours to organise your cleaning, rinses easily to release food particles, scratch-free on non-stick pans, hanging loop to promote fast drying. Good for: doing the dishes, cleaning ceramic and enamel hobs, removing soap scum from kitchen fixtures, scrubbing tiles and grout clean. 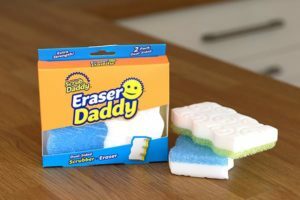 Benefits: doesn’t scratch any surfaces, soft in warm water, firm in cold water, 6x more absorbent than leading sponges, multiple colours for colour coded cleaning, ResoFoam® sponge stays soft even when dry, rinses clean with just water, generates tons of suds for a soapy lather. 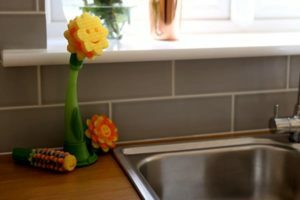 Good for: Daisy head is the multipurpose scrubber for bowls, pots and pans etc., Hyacinth head is good for tall bottles and glasses, the Sunflower head is angled at 45° for scouring flat surfaces plus has a built-in scraper on the back. Benefits: ergonomic, soap dispensing, suction cup base self-drains, top rack dishwasher safe, soap-dispensing wand, multi-purpose heads. 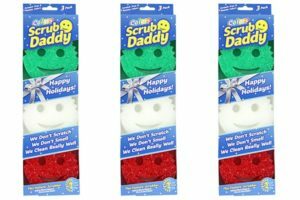 The Holiday Pack features three Scrub Daddies with all the features you already know and love but now with two new limited edition colours, white and red! 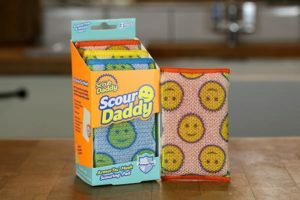 Let us know how you use your Scrub Daddy products below and don’t forget to share pictures with Scrub Daddy on social media too!